Do you love to eat Italian food? Discover how easy it is to create authentic Italian recipes in your own kitchen. If you enjoy Italian food, this recipe book is for you. Italian food has become a favorite with its variety, flavors, colors and easy availability of ingredients. It's kid friendly, easy to make, uses healthy fresh ingredients and you can create something that looks amazing in little time. With A Taste of Italy: Authentic Italian Recipes, you can try out a whole new range of ideas that are amazingly delicious and will have your family wanting more, with recipes for: Best Marinara Sauce Recipe Fettuccine Florentine Fresh Vegetable Frittata Pomodorie Gnocchi Chicken Marsala Torta Di Ricotta (Sicilian Cheesecake) And more...Now any mealtime can feel like you are back on that amazing vacation, where you dined on a Roman side street or in a bistro overlooking the Amalfi coastline. From a simple Sicilian Tomato Salad to the delicious Italian Cream Cake, you can be serving one amazing dish after another, every day of the week! A Taste of Italy: Authentic Italian Recipes is a landmark book with 120 unique recipes that will transform any meal into something special. If you like Italian recipes, then you'll love this fantastic resource. 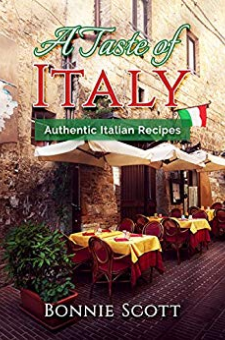 Buy A Taste of Italy: Authentic Italian Recipes today and see for yourself how easy it is to make this delicious cuisine!